The My Spoon robot was recently nominated as one of the top ten finishers for the Top Ten Robots listed by Japan's Ministry of Economy, Trade and Industry (METI). My Spoon is an assistive technology developed to help people who cannot feed themselves. My Spoon is intended to be used by patients who are partially or completely disabled. It can be used with almost any kind of food (no special food packets are required); solid food should be in bite-sized chunks. (It does require that the supplied tray is used.) It can be tailored for different degrees of disability. The My Spoon robot is designed for safety. The manipulator is designed so the fork cannot hurt the user; its position is set at the beginning of each meal. Also, the manipulator has very low power. 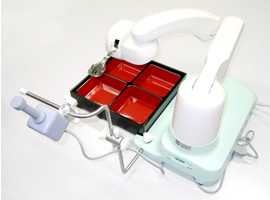 Using the joystick, select the compartment from the included tray which contains the desired food item. After the spoon reaches the compartment, use the joystick to fine-tune its position near the item. After the spoon is in place, instruct the spoon to grasp the food by using the joystick. The spoon will grasp the item and automatically approach the mouth. When the mouth comes in contact with the spoon, the fork will automatically retract. Under fully automatic mode, My Spoon will automatically select a compartment, grasp a food item and carry it to the mouth. Although this is a wonderful addition to the assistive technologies now available to people who really need it, I confess that I am also wondering how Americans, the fattest people in the world, might make use of this technology. I'm afraid I can see this being built into a lounge chair; sports fans (and soap opera fans) will only need to press a single button and then keep watching tube while their faces are stuffed automatically. Why even expend the energy needed to cook fresh food? Why should you have to bring the food from the kitchen? Read more about My Spoon.